I&K Moisturising Shampoo (250ml) - specially designed for hair extensions, this shampoo is formulated to nourish the hair while cleansing, leaving your hair with a smooth and healthy finish. I&K Moisturising Conditioner (250ml) – smooth's and nourishes the hair while relaxing the hair to leave it shiny and easy to comb. I&K Leave In Antistatic Spray (250ml) – specially designed for hair extensions, this light weight leave in spray conditioner maintains the hairs moisture and provides extra nourishment and shine. 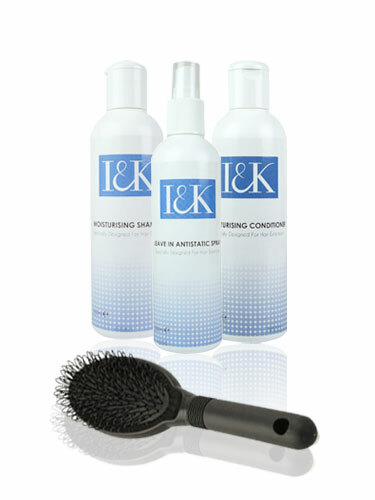 Its special formulated elements detangle and smooth your hair to reduce split ends and eliminate that dry hair feeling. Hair Extension Loop Brush – the loop brush detangles your hair quickly and gently with its soft and flexible loop bristles. More gentle and softer than normal hair brushes, the bristles have been positioned in a way that they will not interfere with extensions bonds. The differing bristle lengths not only ensure that both your natural hair and extensions are left in excellent shape, but are also effective at removing tangles. How To Use: To protect the hair and scalp, start brushing from the tips of the hair: first the ends, then the mid lengths, and finishing with the root area, brushing in sections.